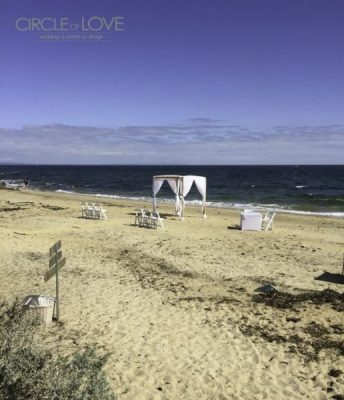 Regardless of whether you are a hopeless romantic or not, it is hard to argue that beach weddings are a whole other story. 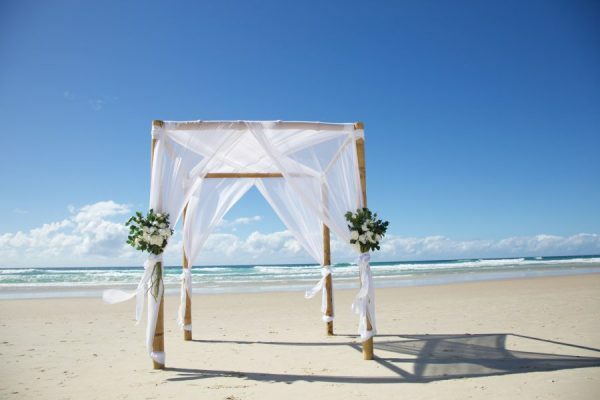 Feeling the warm sand under your feet while saying your vows and letting the crashing waves provide you with the best possible background noise you could ever wish for, is there a better way to tie the knot and celebrate your love with your significant other? 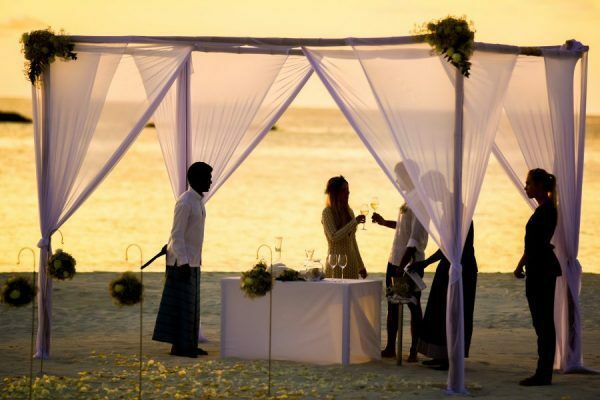 However, wedding planning in itself is quite the endeavour, and the same is true for beach weddings. 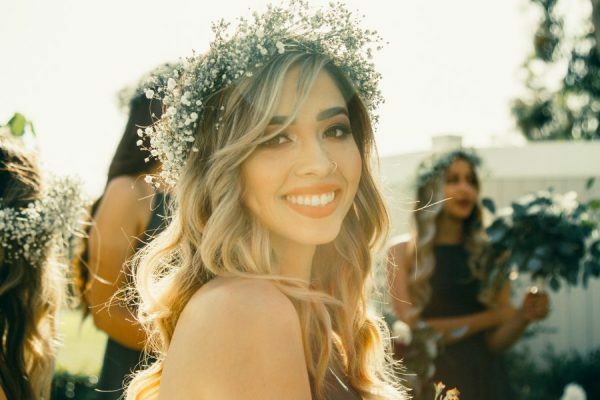 Chances are you have already planned this whole event in your head a hundred times, but just in case you missed a crucial detail, here are six tips for planning a magical beach wedding. Take notes. Being out in the open, chances are the wind is going to blow. And even if it’s just slightly windy, it can become an inconvenience for you if you have a veil and a gown that was not chosen with a beach wedding in mind. Try to keep it practical when you’re looking for your gown and choose a light fabric that won’t get in the way when moving around on the beach. When it comes to your veil, you might want to skip it altogether and opt for some lovely hair decorations instead, unless you want some pretty funny shots, that is. Also, forget about high heels in the sand. We just mentioned the breeze, but there is another thing that you must keep in mind at all times, and that is the sun. Especially if you’re having your ceremony in a sunny country like Australia, you must put on and reapply sunscreen throughout the day if you don’t want to end up looking like a lobster the next morning. Provide ample shade for your guests too if your ceremony is during the day, as you want people to have a good time. You should also be prepared for the unwanted scenario of rain on your big day. The best way to have a backup plan is to organize the ceremony close to a venue that will serve as plan B in case of bad weather, but at least have a tent set up in case of light rain. 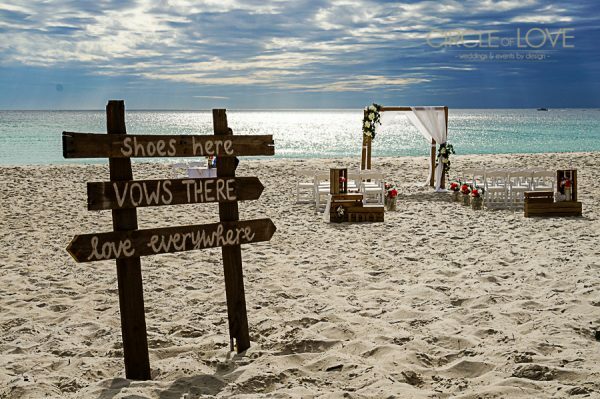 Obviously, the most important part of a beach wedding is the beach. When it comes to choosing your stretch of sand to say your vows, you should pay attention to several things. First of all, decide between a public and a private beach. While the latter might be the more expensive option, if you don’t want random bystanders and tourists in the background of your pictures, it might be the better idea. You can also reserve a section for your ceremony as a third option. The other issue is whether you will need special permits. All in all, trusted wedding specialists are going to give you peace of mind in these questions, so turn to them with all your uncertainties. With the waves, the birds and the general outdoor noise at your wedding, your guests might have trouble actually hearing anything at the ceremony. So, think about this in advance. Your Celebrant will most likely have a sound system, if not consider renting one. It will make all the difference! While this might not look like an issue to think about right now, you don’t want to place your wedding ceremony in the middle of nowhere where guests are going to have trouble getting to. If your reception will be on the beach as well, this is going to make getting all the necessary stuff to the site difficult too –not to mention the food and the cake that can only take heat for so long. With beach weddings, you even have to keep in mind that not all flowers are going to take the heat well. However, the easiest solution to this is looking up which flowers are up for this task and choosing those for decoration. Local florists will surely know the ins and outs of what the best choice would be. As for the rest of the decoration, make sure you continue to keep the wind in mind and go for seashells and other natural elements that are going to stay put. 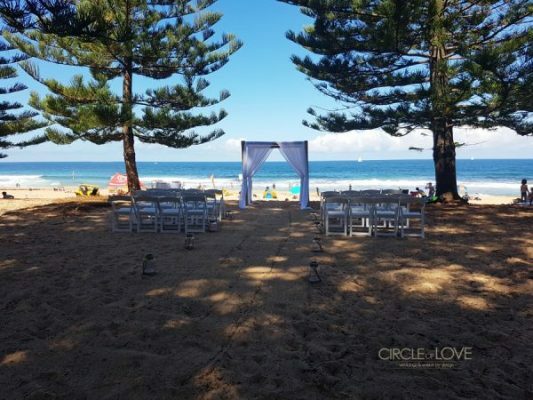 Organising a beach wedding brings a whole new set of challenges into the game, but in the end, when you look at your amazing wedding photos, you will know it was worth all the fuss.